“Today My Heart listens to the supplications of the innocents and of the poor. Today My Spiritual Soul embraces those who have most suffered chaos and destruction. Today I announce Myself to your hearts as the Lady of Akita (of a province of the northeast of Japan) to remind you that My Immaculate Heart belongs to the entire world and today especially to Asia. Today, in a time of great emergencies for all, My Son Jesus has asked Me to tell you the Truth as a good Mother of all, even if the Truth may be painful as it was for Me on Mount Calvary. I want to help you, to assist you, to caution you and to warn you that in this cycle it will be necessary to transform yourself so that the world may also be transformed and may be consecratedagain to the Original Project of God. Beloved children, you have seen that your planet suffers with each new movement and that these catastrophes take the precious and innocent lives of many souls. For this today I ask you, My dears, that you open your eyes to the call of the Light that comes from Heaven. While you without perceiving it, share My Kingdom of Peace, on the other side of the world the souls die and disappear from the surface of the Earth. 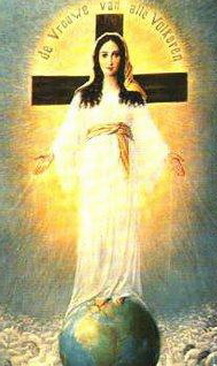 God wishes to spread the absolute devotion to My Immaculate Heart and in Akita, Japan, I have transmitted an important call to transform the actions of the consciousnesses in the same way that since the year of 1981 My Voice was made to be heard in the whole Africa through the Apparitions in Ruanda. Now I Am among you. Is this for some reason? What is that which your Highest Father wants to tell you through My Holy presence in South America, as in Medjugorje? It has always been that humanity matures after all that which occurs but now I ask you that out of love you awaken on time to the Truth that Heaven wants to reveal to you. It will be this Sacred Truth that will prepare you for the return of My Son to the Earth." ..."Little ones, the world is reaching a culminating moment because after My Apparitions here in South America and in Medjugorje the times on the Earth will change and humanity will have to prepare itself for the Universal Judgment." for all of the souls that live upon the Earth. and raise, through My offer, the lost hearts. O Wise Father of Light! that we deposit in You Sacred Altar. to consecrate His beloved humanity. Listen now, Lord, to Your Faithful Messenger!